In a world where French food was for long the benchmark by which all culinary good taste was measured, Japanese eclipsing French cuisine is a shocking reversal, not least because the Michelin Guide is one of the great bastions of the French gastronomic tradition. 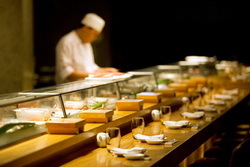 Some commentators’ spiteful claims that the guide’s findings signal the death of French cuisine may seem premature – France’s score is still impressive given that it has half Japan’s population – but anyone with a pair of eyes and a working set of tastebuds could tell you that Japanese food has been taking over globally in recent years. But while Michelin’s endorsement of Japan could hardly be more enthusiastic, is it possible that its top ranking for 2012 is just a case of the guide (which first covered Japan only two years ago) waking up to a level of quality that has always been out there? The Japanese food writer Kimiko Barber, who will host a Japanese cookery demonstration at the 30th annual Sharjah Book Fair on November 24, insists that Japan’s current level of excellence is indeed something new. “When Japan opened up, the country was so hungry for anything western. After the bubble era of the 1980s ended, however, there was a reappraisal among Japanese about what was important, and people started looking around them for inspiration rather than chasing the next expensive international trend. It’s not just a case of excellent local cuisine – many Michelin stars have been awarded to Japanese restaurants selling foreign-inspired food as well. As Barber notes: “There is also excellent non-Japanese food in the country – you can even find things like very high-quality, delicate French patisserie. Very generally speaking, the level of Japanese imitations is often higher than that of Japanese food made in foreign countries. While Japanese cuisine has been reaching new heights, France’s gastronomic star has been falling slowly but steadily for some years. The original home of haute cuisine was once where the whole world looked for inspiration in matters culinary; now its restaurants aren’t even the best in Europe. For the past decade, Spain – and more recently Scandinavia – have been the places to look for real inspiration. The sheer inventiveness of chefs such as El Bulli’s Ferran Adria and Noma’s René Redzepi make haute cuisine specialists such as France’s Alain Ducasse look a little staid and corporate. Reports of French cuisine’s demise are, of course, much exaggerated – there are still many fantastic chefs at work in France, and the country’s variety of regional cuisines remains hard to rival. Nonetheless, the French are now almost as addicted to convenience food as anyone else in the world, and the excellent little local restaurants for which the country was once famous have been falling like flies during the current recession. Outside the country, French food is still a byword for sophistication, but even though it has lightened considerably in recent decades, the country’s fare seems heavy next to the exquisite delicacy of super-healthy Japanese food. But is the Japanese food taking over the world the real thing? It’s likely that Japan’s many chefs in the Michelin Guide would react with dismay if they saw what was dished up in their country’s name globally. The Japanese might find such bizarre offerings as sashimi made from defrosted fish, or sushi rolls with avocado, hard to recognise. Such foods run counter to the underlying principles of Japanese cuisine, says Barber. Eating exotic air-freighted fish – delicious though it might be – hardly fits well with this Japanese belief in eating seasonal, locally available ingredients at their exact peak. Still, any successfully exported cuisine ends up spawning local versions wherever it goes. Any Neapolitan would be horrified to find what’s served in a branch of Pizza Hut, while most “French” bread sold outside France is actually nothing of the sort. This normal process is hardly anything to cry about. And if Japanese food’s international fans are genuinely curious about what authentic Japanese food might taste like, at least now they have the new Michelin Guide to tell them where to look. how i wish to join in your good restaurant as of my experienced and love of art in japanese cuisine.i love the art of sushi in your restaurant and i love doin too.thanks a lot.